What's your current website, if applicable? Type of work that you would like our help with? What goals are you hoping to accomplish? How will you know that your project has been a success? Is this for your employees, customers, or prospects? What do you want them to do, buy, read, watch, etc? Who do you scope out when you are looking to shake things up? C'mon we know you do it. Give us some examples of what you like, and tell us why. This helps a lot, we suggest at least 3. What's the project's budget? It's probably the most important and difficult question to answer. If you haven't already thought about what your project might cost and you can afford, now is a good time. Anything else you feel we need to know. 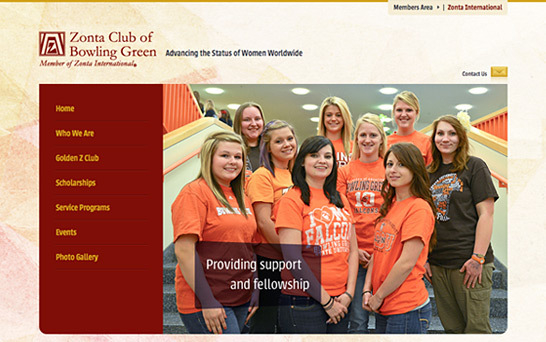 The BG Zonta group wanted a fresh look for their tired site – and Martini Creative was happy to accept the challenge. On the heels of the organization’s newly established university club, the new site features enhanced functionality for all of its members. WordPress is utilized at the content management system, a membership application is available online, as well as scholarship forms and “members only” area. Stay tuned for more…the Zonta Club of Bowling Green has much more in store for 2013. 419.353.9696 318 N. Prospect St.
© 2019 Martini Creative. All Rights Reserved.